Obesity is a disease characterized by the excessive accumulation of body fat. An overweight adult has a body mass index (BMI) between 25 and 29.9. An obese adult is one with a BMI of 30 and over, while a morbidly obese adult has a BMI of 40 or higher. Some people have a high BMI because a very large percentage of their weight is derived from muscle, thus they are not really obese. Conversely, a person may have a low BMI but have little muscle, thus an unhealthy percentage of their body weight is derived from fat. Obesity (obesity or metabolic syndrome) includes an enlarged waist circumference, also called abdominal obesity, high blood pressure, elevated triglyceride levels, and resistance to insulin. To qualify for disability benefits, an applicant must show very limited mobility and functional abilities. 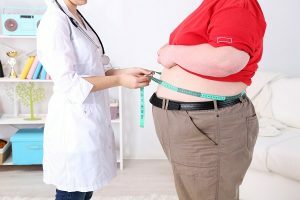 In the alternative, an applicant may show that the obesity or metabolic syndrome has caused damage as a result of cardiovascular disease or diabetes. Applicants may automatically qualify for disability benefits under a Listing of Impairments in the SSA’s Blue Book. However, the Social Security Administration (SSA) removed it from the Blue Book in 1999 since many believe that obese persons may hold gainful employment. Thus, presently, applicants suffering from obesity may qualify for benefits if either their functional limitations equal those in an impairment listing or the obesity contributes to or causes other listed impairments. For example, if the obesity causes the inability to effectively walk, the individual’s condition may “equal” an impairment-level listing for major dysfunction of a weight-bearing joint. Obesity may contribute to or cause other impairments in the musculoskeletal, respiratory, and cardiovascular systems, as well as diabetes, stroke, hypertension, osteoarthritis, gall bladder disease, cancer, and sleep apnea. Morbidly obese people often suffer from cardiovascular disease, diabetes mellitus, osteoarthritis, sleep apnea, and hypertension. The SSA also reviews how the effects of obesity worsen the ability to function with these other impairments. Obesity may cause greater pain or fatigue, thus limiting the obese person more than a person of normal weight, i.e., a BMI less than 25. An experienced disability attorney may ensure that any applicant fully takes advantage of the rules intended to help individuals obtain eligibility for disability benefits. Do you have a potential disability claim? To improve your chances of meeting all of the requirements for the allowance of a claim (and avoiding the denial of benefits), retain the services of a qualified Kentucky Social Security Disability attorney. Contact Sullivan Law Office today. We offer free consultations, so you have absolutely nothing to lose! We look forward to hearing from you. Call 888-587-0228 or visit us online.